It is impossible to avoid being tugged into this compelling human drama. Powerful and unsettling, this Sundance Film Festival award winner is based on the true story of a Caribbean immigrant who spent decades in prison for a crime he didn’t commit. The film starts off in the spring of 1980 when a teenager is gunned down in Flatbush, Brooklyn. 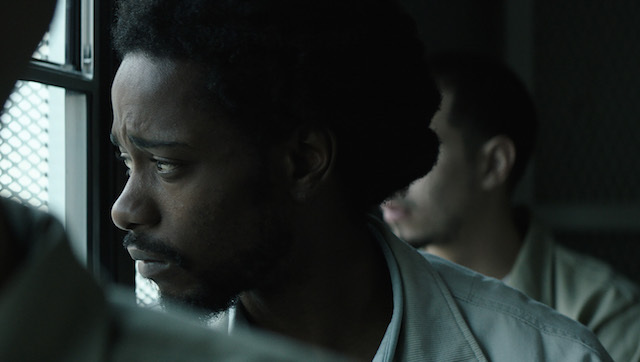 A child witness is pressured by the NYPD to identify a suspect resulting in Colin Warner’s (Lakeith Stanfield) arrest. 18-year-old Warner, who is from nearby Crown Heights, is picked up while running errands for his mother and ends up being wrongfully convicted of murder and sentenced to life in prison. What follows is a battle by Warner’s childhood friend Carl ‘KC’ King (Nnamdi Asomugha), who devotes his life to fighting for Colin’s freedom, eventually becoming a legal courier to lead the fight for his exoneration after tireless appeals. Throughout the film, Stanfield as Warner, emerges as a likable man with an astonishing ability to reject anger and bitterness. At every point, he is at the center of the story, and he carries the film with an impassioned performance. Stellar in the role, playing the character at several ages between 18 and 48, he does a solid job of bringing dignity and realism to the role. Nnamdi Asomugha, (who produces the drama under his company iAm21 Entertainment ) as Carl King, Colin’s crusader, also doesn’t disappoint. It’s a film, which explores the power of friendship, for as the movie chugs inescapably forward, King’s unwavering devotion to his friend is remarkable. He dedicates his life to overturning the murder conviction, even risking his own marriage in a quest for justice that toils through 20 plus years of self-sacrifice and heartache. Ruskin deserves praise for capturing the realism of underdogs fighting against the odds, and its message is noble and notable. With moving performances and a solid storytelling “Crown Heights” is a visual trip worth taking and it’s impossible to avoid being tugged into its human drama, which has been prompted by an endless stream of high profile exonerations. “You never know how sacred your freedom is until it is jeopardized,” a dejected Warner shares in one mournful scene after yet another legal setback. If you aren’t compelled to re-examine your conclusions on crime and punishment, then you need to see “Crown Heights” again until you are.